Years ago fish heads were discarded items from restaurants as customers were not amused by piercing eyeballs popping up from behind scaly thick skulls ! Actually we can understand as nobody likes skeletons, especially at night. But today how things change as these ugly marine heads with their indestructible mini '300' ( Sparta ) shields & spears ( do see the Hollywood Blockbuster soon if you haven't ! ) have become prized gourmet items in Chinese ( yes Japanese too ) and Indian cooking ( and in the process created many fast track Millionaires as side dishes ) , and some like click here babe-kl's Stadium High / Kg Pandan Fish Head Curries have actually achieved a cult following. For example the click here Chan Sow Lin area in Sg Besi Kuala Lumpur is famous for its flavourful Chinese styled fresh water clear or wine steamed 1/2 fish heads while Setapak/ Hot Springs for their broken into usually 11 pieces spicy fish head assam curries overcrowded into old Chinaman claypots. Then also most major Indian Restaurants will have a signature fish head curry menu to complete their Maharajah experience, on top of their banana things. 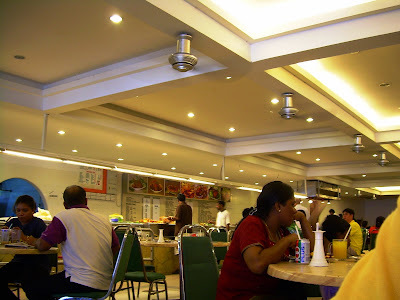 This upscale Indian Restaurant( with Islamic Food ) beside the Caltex & Police stations off Jln Ipoh Kuala Lumpur has more than 100 tables in air con comfort , complete with black and white tuxedo waiters. It has the usual range of lavish nasi kandar styled curry spreads including giant prawns, many crabs and the whole fried meats (esp chickens ) section patronised by multiracial families, the power dressed corporate movers & shakers (and we suspect that hush hushed dubious looking 'jangguti' moustachoed gang posturing for the coming soon next General Elections ) , some xcited Taiwanese tourists and the occassional odd couples (daz bcoz this place is mainly for Gluttons what with all those noisy stinky oily orangee lips). Yes it is true the love for superhot curries ( & babes ) is i n d e e d very deep. RM35 , the star (...who says crabs are Xpensive ? ) 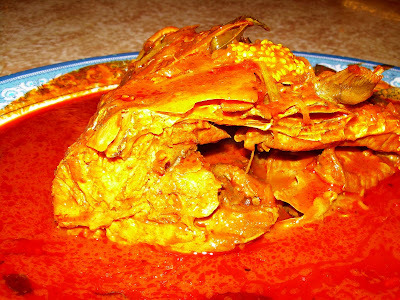 dish of 'ikan merah' fish head curry. Probably all 420g of cartilage, bones ( and slime ?) + skin and some miniscule embedded still -looking- for- it- meat...in a slightly aromatic thick creamy orangey little sour quite salty & fishy hot curry brew with favourite companions okra ( lady's fingers ) and eggplant( brinjal ). 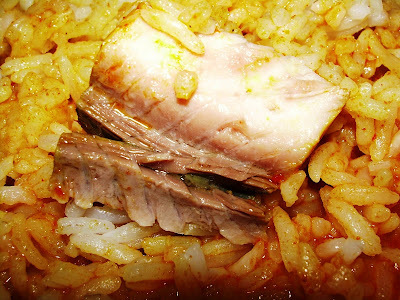 About rightly done with firm meat ( not loose )and served hot ( but not steaming ). Delicious only when taken with steamed white rice ( otherwise its too salty ) ! Highly recommended for diehard gluttons or those on a need to impress but still the lingering 45 mins aftertaste and colorful ugly looks might be totally worth it. gosh drooling liau... but seriously ka those waiter really wore like dat? wow.. tuxedo waiters?? not bad..
OMG, the curry fish head is so orange and red. 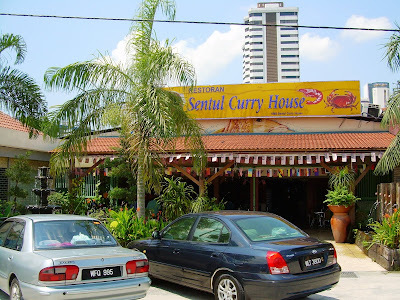 It's different from Penang one, Penang ones has various veggie - tomatoes, okras, etc. but really black & white ! ok nex your turn English head with Indian curry yes ? great to have you here ( another supercook ! ) and welcome to backstreet. dun sorry next time V promise to cover your eyes then try to just let u taste it...can ? yr last trip u missed this one head and a few tails so dun forget ! the tomatoes fell of before reaching us sorry ! have you tried the Big Two fish heads near Jln Yap Kuan Seng ? Kg Pandan & Stadium? Fantastic !